What says summer picnic more than tomatoes and basil? 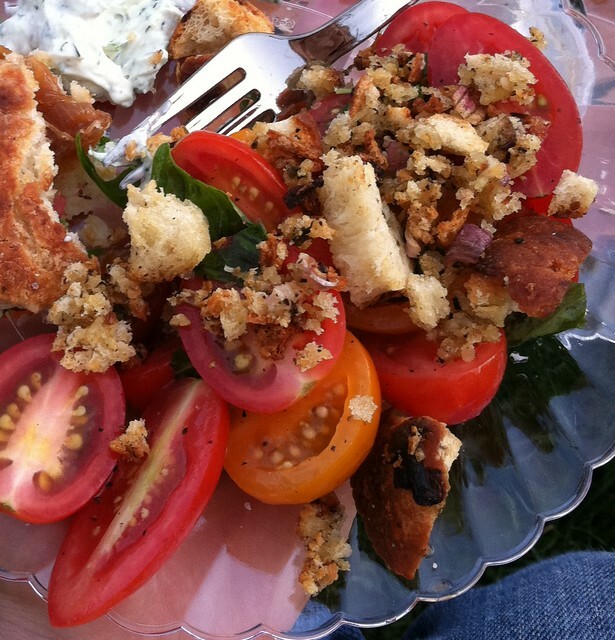 This salad recipe will be the final post on recipes from my Ravinia picnic. I found this recipe on the great Smitten Kitchen blog and adapted it just a bit. It is a combination of tomatoes, garlicky croutons, fresh basil and tart vinegar. Yummy. The salad is really simple but makes the most of good ingredients. A new Mariano’s grocery store just opened up by me and I might be a little obsessed. They have a great produce and bread section which I took full advantage of for this recipe. I used multi-colored grape tomatoes which added a lot of fun color. For the bread I used an Irish onion potato loaf and threw the leftover bread in the freezer. I am pretty sure this Perfect Pairing of plastic containers is not going to knock your socks off because we probably all have that cabinet full of unruly containers with missing lids. What makes them the Perfect Pairing for this recipe is because I brought this salad to a picnic and the containers kept everything in its place and it was fresh and crunchy for the meal. I packed up my picnic about 10 hours before we were going to eat so I wanted to keep the dressing off of the tomatoes and croutons and also not have it leak on the rest of the picnic items. I put the sliced tomatoes in a medium sized container and the dressing in a small, ½ cup sized container and nestled that in with the tomatoes. If a little dressing leaked out, no big deal, at least it was not all over everything else. I put the croutons in a flat plastic container and tossed that in with the dry goods in the picnic basket. I kept the basil leaves whole in a plastic bag and tore them up right before we ate to keep them from browning. At the picnic I shook up the dressing, tossed it over the tomatoes and topped the whole thing with the crunchy croutons and torn basil. An al fresco prep station! Preheat oven to 350 degrees. Chop bread slices in food processor until they are in uneven chunks, the biggest should be about 1 inch. You can also just keep tearing it apart if you don’t want to get out the processor. Place crumbs in a bowl and toss with shallots, garlic, salt, pepper to taste, 2 Tb. Olive oil, and grated cheese until they are all coated in oil. Spread out on a baking sheet and bake until golden brown and dry. Allow croutons to cool before serving or storing. Place tomatoes in a bowl, set aside. Combine remaining olive oil, sugar, vinegar and salt and pepper to taste, whisk to combine. Toss the dressing with the tomatoes, top with croutons and slivered basil.